HRN Division Rankings: So, who gets Horse of the Year? As soon as Accelerate crossed the finish line in last Saturday’s Breeders’ Cup Classic, the Horse of the Year debate -- the one that I had indicated readers of these rankings of for weeks -- indeed arrived. Before Accelerate even entered the winner’s circle on Saturday, the Horse of the Year questions were already being asked of the connections, and they should be. Accelerate finished off a campaign and that would give him the Eclipse Award in most any other year. What once seemed like a far-fetched possibility is now a reality, giving us the biggest Horse of the Year debate since Rachel Alexandra vs. Zenyatta in 2009. In Justify and Accelerate, we have two worthy Horse of the Year contenders. Justify supporters will argue that he won the Triple Crown 111 days after making his first start. He won the Kentucky Derby without a race at age 2, becoming the first to have pulled that feat off since 1882. His short but brief career was like nothing ever seen in this sport. Accelerate's backers will say that he too has pulled off a unique feat. He was the first horse to ever sweep the three major California Grade 1 races held at 10 furlongs -- the Big 'Cap, Gold Cup at Santa Anita and Pacific Classic -- then go on to win the Breeders’ Cup Classic. He also is unbeaten at 10 furlongs. Justify fans may knock the competition Accelerate faced in the races that led up to his Classic win, but Accelerate beat more Grade 1 and graded stakes winners than Gun Runner beat in his 2017 campaign leading to his Classic win. Accelerate lost one race by a neck, the Oaklawn Handicap, to the eventual Breeders’ Cup Dirt Mile hero City of Light. Among the also-rans in the Dirt Mile were Bravazo, a horse that almost denied Justify the Preakness. In the Breeders' Cup Classic, the best a 3-year-old finished was Mendelssohn in fifth place. Catholic Boy and McKinzie, horses that dispatched many of the Triple Crown also-rans in the Travers and Pennsylvania Derby, were up the track. For the 3-year-olds, it was their worst showing in a Classic since 2012. The Horse of the Year debate is a fascinating one, and that’s a good thing for the sport. Speaking only for myself, I look at Horse of the Year as just that: the entire year. Justify stunned the racing world with his brief but brilliant 111 day career. The only knocks I have are about just how brief it was, and the fact that as the season went on, the crop of 3-year-old olds began to look progressively worse. Remember the premature talk by some around the Kentucky Derby about how this crop was the best in decades? No 3-year-old male has won a graded stakes on the dirt at a mile or more over older horses so far in 2018. Accelerate’s season started in early February and concluded in last Saturday's win. He raced an entire season, and he beat all comers in the Classic. With such a worthy candidate in Accelerate now as a viable Horse of the Year candidate, what sort of message is sent in voting for a horse whose season ended in June? Or, what message can be sent by casting a vote for Accelerate? It would take quite the resume to unseat Justify for Horse of the Year, but for me, Accelerate checks all the boxes. He will get my Horse of the Year vote. As for the other divisions, most are now decided, but a few questions remain. For female sprinter, the Eclipse will likely go to Marley’s Freedom. She had the best season, despite her off-the-board finish in the Filly & Mare Sprint. In the female turf division, look no further than Sistercharlie. Her four Grade 1 wins are more than enough to secure her the Eclipse over Enable. Enable may be a special filly, but it was Sistercharlie who raced in the United States the entire season and will win the Eclipse based off of her body of work. The male turf division is a mess, and there are still a few high-profile grass races left. If anyone has an opinion on this division I would love to read it. It's that open. The older dirt female division will boil down to Unique Bella and Abel Tasman. Both have credentials, and both have two Grade 1 wins this season. I have yet to decide which way to go here. The division that will generate much debate is the 2-year-old filly Eclipse. Newspaperofrecord was probably the most impressive winner Breeders’ Cup weekend. As 2-year-olds go, she is one of the most impressive on the lawn that I have ever seen. But Jaywalk was dominant in her last four starts, and any other year would be a lock for the Eclipse. Could this be the year that a 2-year-old turf filly wins the Eclipse? Remember, we are in a new era with 2-year-old grass races, as there are more opportunities for these fillies to make their mark. Newspaperofrecord could very well win this Eclipse, but Jaywalk did enough for me with her two Grade 1 wins. Have a thought on the Eclipse Awards? Feel free to comment below and make your case. 1. 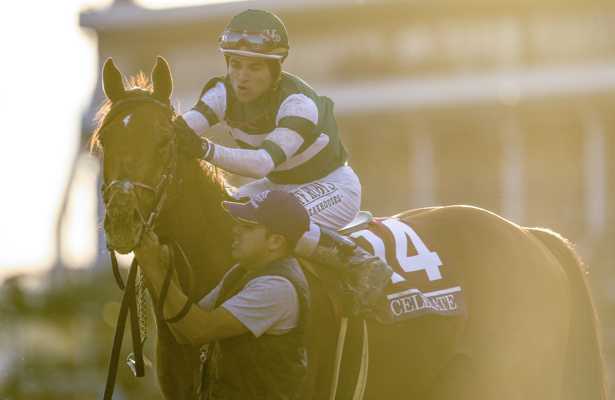 Accelerate – His Breeders’ Cup Classic win capped off a tremendous season, but he's not yet done. Before heading off to stud at Lane's End Farm, the Jan. 26 Pegasus World Cup remains. 2. Thunder Snow – The Dubai World Cup winner ran his heart out in the Classic, attending to an early fast pace and holding on well. Will stay in training to defend his Dubai crown. 3. City of Light – Ran one of the best races of the weekend in easily dispatching a strong Breeders’ Cup Dirt Mile field. Will be pointed for the Cigar Mile and then a possible run in the Pegasus. 3. Diversify – Never had a chance in the Jockey Club Gold Cup (G1) with the fast early fractions he set. Future plans are undecided. 5. Yoshida – Ran a great race to just be edged for the show spot in the Classic. The future for this guy is indeed the dirt. 1. Abel Tasman – Never was herself in the last two starts of her career. The Eclipse will come down to the top two here, and it's tough to separate them. Abel Tasman won two Grade 1 races on the season. 2. Unique Bella – Still in with a real shot at the Eclipse now. She too has two Grade 1 wins on the season, though never faced the quality of competition that Abel Tasman did in her wins. 3. Elate – A missed opportunity in 2018, but she will be back in 2019. 4. Wow Cat – Really stepped up her game in her last two starts. Her Breeders’ Cup Distaff was her best race to date. Should she stay in training, she will be among the leaders of the division in 2019. 5. Blue Prize – Beaten a head for the show spot in the Distaff, she too ran one of her best career races in defeat. Next 5: Salty, Martini Glass, Champagne Problems, La Force, Fault. 1. Justify – Now retired, he will win the Eclipse as the top 3-year-old male. Horse of the Year, once a foregone conclusion, is now a real debate after Accelerates Breeders’ Cup Classic win. 2. Audible – Returned to the races with an impressive win on the Breeders’ Cup undercard. The feeling here is that this guy may end up the second-best of this crop. He's targeting the Pegasus. 3. McKinzie – It was too much too soon in the Breeders’ Cup Classic. Will regroup. 4. Catholic Boy – After a poor start in the Classic, he was eased to the wire. We'll see him back at age 4. 5. Mendelssohn – Impressed me in the Classic with how he stayed on after setting a fast pace. Finished the best of all the 3-year-olds in the race. Next 5: Bravazo, Vino Rosso, Firenze Fire, Axelrod, World of Trouble. 1. Monomoy Girl – Her campaign was among the best a 3-year-old filly has ehad in the Eclipse award era. She will be a Horse of the Year finalist, and in many years, she would win the award -- but not this year. 2. Midnight Bisou – If not for Monomoy Girl, this filly would have won the Eclipse. She capped off a strong season with a third-place finish in the Breeders’ Cup Distaff. 3. Dream Tree - She was an impressive Prioress (G2) winner off a long layoff, but missed the Breeders' Cup Filly & Mare Sprint due an epiglottic entrapment found after a recent workout. Expected to be back at 4. 4. Wonder Gadot – The long season seemed to have finally caught up to this filly in her last few starts. 5. Shamrock Rose – Won her last four starts, which includes beating older in the Breeders’ Cup Filly & Mare Sprint. Next 5: Eskimo Kisses, Red Ruby, Talk Veuve to Me, Chocolate Martini, My Miss Lilly. 1. Stormy Liberal – Outside the box thinking has to be considered here in a division that is a mess. 2. Robert Bruce – Did win two graded stakes this year, including a Grade 1. Beaten 18 lengths in the Turf while seventh. 3. Channel Maker – Similar resume as Robert Bruce, one Grade 1 and Grade 2 win. Beaten 42 lengths in the Breeders' Cup Turf while 11th. 4. Arklow – Only one Grade 3 win on the season, but at least he finished fourth in the Breeders' Cup Turf, but still beaten over 11 lengths. 5. Glorious Empire - Was dead last in the Breeders' Cup Turf, but was very good over the summer at Saratoga. Next 5: Divisidero, Hi Happy, Sadler's Joy, Heart to Heart, Catapult. 1. Sistercharlie – Really showed a lot of heart as she ran down the European favorite, Wild Illusion, in the Breeders’ Cup Filly & mare Turf. She will win the Eclipse based off her four Grade 1 wins this season. 2. Enable – Became the first horse to pull of the Arc/Breeders’ Cup Turf double, as she was able to fend off the 3-year-old filly, Magical. I don't believe she will not unseat Sistercharlie for the Eclipse. 3. Fourstar Crook – Played second fiddle to Sistercharlie for most of the year and ran evenly to finish seventh in the Filly & Mare Turf. 4. A Raving Beauty– Ran her career-best race in the Filly & Mare Turf, beaten a length for the win. 5. Ultra Brat – Her last two starts have been solid. She was a hard-luck Diana (G1) loser when Sistercharlie changed leads late and surged at the wire. Next 5: Daddy’s Lil Darling, Rushing Fall, Californiagoldrush, Uni, Vasilika. 1. Roy H – He saved is best career race for this years’ Breeders’ Cup Sprint. After overpowering the field and winning the Sprint for the second year in a row, he will repeat as the Eclipse Award winner of this division. 2. Imperial Hint – Ran into a buzzsaw in Roy H in the sprint but still finished up well to be third. 3. Whitmore – Breeders’ Cup Sprint runner-up was very consistent in 2018, only out of the two once in eight starts. 4. Promises Fulfilled – Set a ridiculously fast 21.25 opening quarter in the Sprint, but held on well to be fourth, beaten less than a length for third. 5. City of Light – The Breeders’ Cup Dirt Mile winner belongs here based off his sprint resume. Next 5: Mind Your Biscuits, X Y Jet, Limousine Liberal, Ransom the Moon, CZ Rocket. 1. Marley’s Freedom – Beaten two heads and a neck in the Filly & Mare Sprint, she did enough for me in 2018 to win the Eclipse. 2. Shamrock Rose – The Breeders’ Cup Filly & Mare champ won her last four starts of the season. 3. Selcourt – Her first since March in the Breeders’ Cup didn’t go as planned as she finished far back in 12th, beaten over 12 lengths. 4. Union Strike – Her win in the Gallant Bloom (G2) also flattered Marley’s Freedom, who beat her by five in her last start, the Ballerina. 5. Finley'sluckycharm – Ran an even race in the Filly & Mare Sprint to finish seventh. Next 5: Skye Diamonds, Chalon, Lewis Bay, Ivy Bell, Golden Mischief. 1. Game Winner – The unbeaten Breeders’ Cup Juvenile winner is bred to go long. 2. Instagrand – So far has looked like a monster, winning his two starts by a combined 20 1/4 lengths. He will now sit until 2019 to point for his 3-year-old campaign. 3. Knicks Go – Give this guy credit. He outran his odds in his last two starts. Game runner-up finish to Game Winner in the Juvenile. 4. Improbable – Impressive winner of the Street Sense on the Breeders’ Cup undercard. 5. Code of Honor – Scratched out of the Juvenile, but should be a player in 2019. Next 5: Signalman, Complexity, Rowayton, Call Paul, Bulletin. 1. Jaywalk – Breeders’ Cup Juvenile Fillies winner dominated in her last four starts. 2. Newspaperofrecord – The most impressive winner on Breeders’ Cup weekend, she could challenge the top one for the Eclipse. Looking ahead to next year, Chad Brown is thinking Royal Ascot is possible. 3. Bellafina – Failed as the favorite in the Juvenile Fillies but was still a dual Grade 1 winner in 2018. 4. Restless Rider – Ran very well as the runner-up to Jaywalk. 5. Vibrance – Hung tough in her third-place finish to Jaywalk, the best of any West Coast invader. Deserves this spot. Next 5: Mother Mother, Sippican Harbor, Serengeti Empress, Chasing Yesterday.